Sentence of the Day- "Where Are You From?" Bento Box-"A is for Apple"
Fall is right around the corner! With the dawn of cooler temps and falling leaves, comes SOUP weather! It's especially cozy to curl up with a good book and warm mug of soup when the leaves start changing colors. 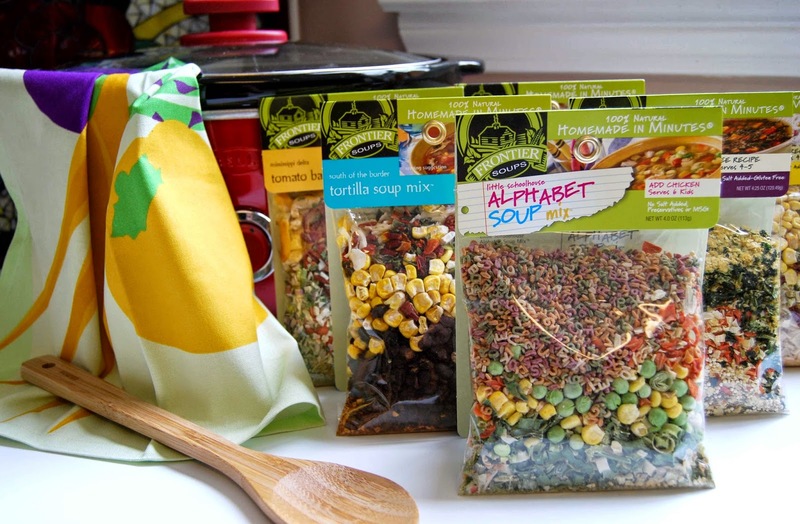 Frontier Soups is a new-to-me company that specializes in quick, healthy soups made from wholesome, non-GMO ingredients. I love that Frontier Soups is free from preservatives, added salt and MSG. What's not to love about that?! Simple directions and no funny, unusual ingredients. Ready in minutes (thirty to forty-five minutes, to be exact), a Frontier Soups dinner can be ready and on the table in no time! Perfect for busy school nights! home. Today, they offer a variety of all-natural soups, stews, chili, and chowders to families around the country." 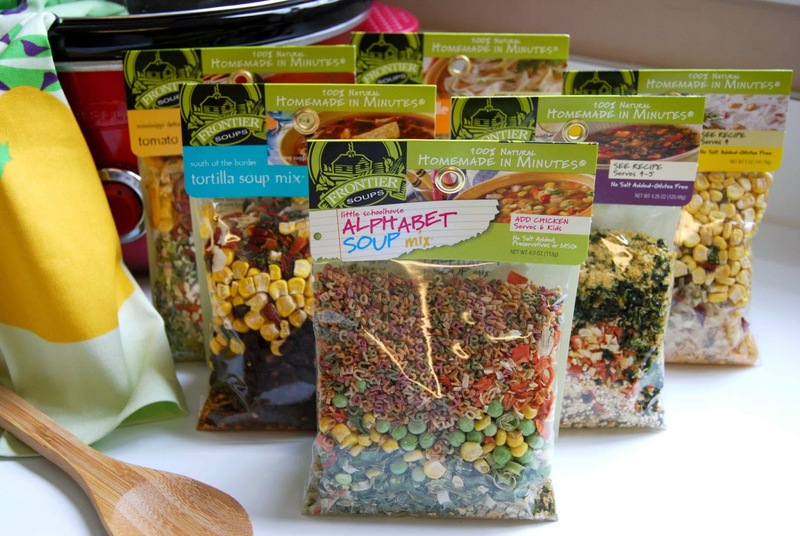 • All Frontier Soups Homemade in Minutes mixes include all-natural ingredients with no added salt, preservatives, or MSG. 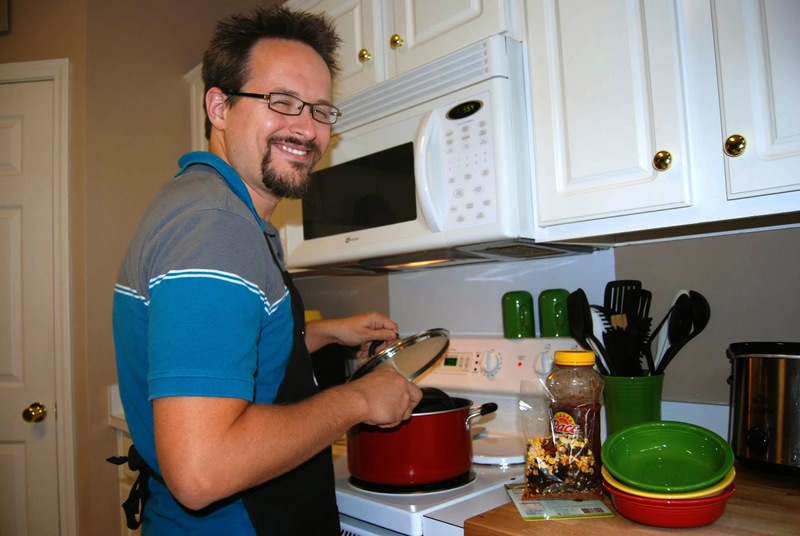 • With the help of Frontier Soups Homemade in Minutes mixes it takes just 30- 45 minutes to create a meal for your family and friends. • All corn and rice ingredients in every mix are certified non-GMO. 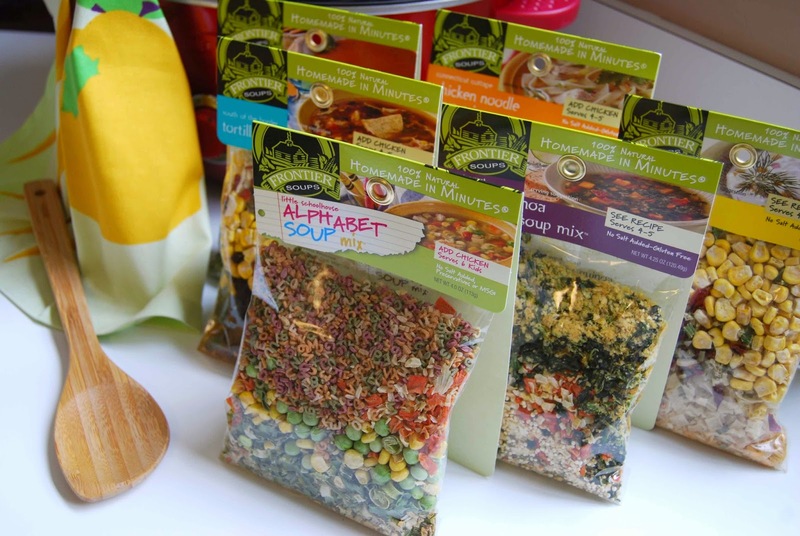 Many of the Frontier Soups mixes are certified gluten-free by the Celiac Sprue Association. • Frontier Soups Homemade in Minutes mixes are available from the following retailers: Whole Foods, The Fresh Market, Kroger Natural Stores, Central Market in Texas, Great Harvest Bread Stores, Omaha Steaks, Braum’s Fresh Markets and 1500 other independent and specialty stores across the country, and in Canada at Sobey’s and Whole Foods. Products are also available online at Frontier Soups, Abe’s Market and Amazon. So, the first soup that we tried was the Tortilla Soup Mix. Soup mix, Salsa, Chicken Broth and Chicken- that's it- and I had everything on hand (even better!). We made this on a busy night where my daughter goes to ballet class right before dinner. I had cooked the chicken in the crockpot all day. So, when we rushed in from ballet, I was able to boil broth, dump ingredients, simmer 25 minutes and VOILA! Dinner was on the table in half an hour. Love.That! Hubby helped stir the pot (ha!). Look at all that goodness in there- black beans, corn, tomatoes and spices- YUM! Now, let's talk about taste, for a moment. Can I just say, "YUMMMMMM!?!?!?!" I was really surprised at the richness and robust flavor of this soup mix. There was nothing wimpy and "dried" about it! 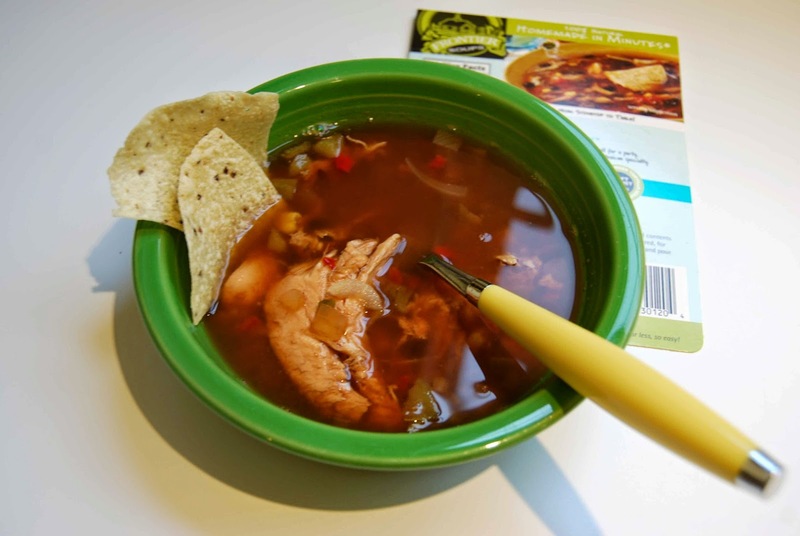 The tortilla soup mix was perfectly seasoned without being too spicy or artificial tasting. We chose to add some tortilla chips and shredded pepper jack to our meal and it was perfect! Warm, hearty flavor with no funny ingredients and ready in less than thirty minutes....? PERFECT! 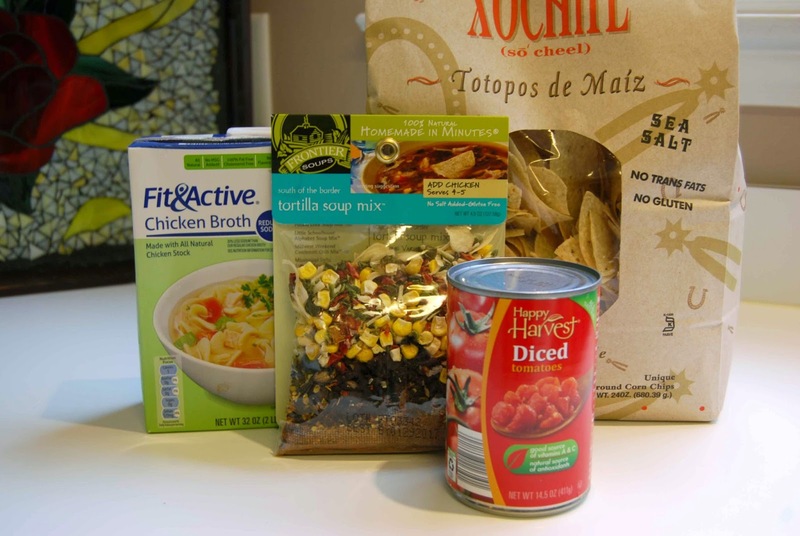 We really enjoyed trying Frontier Soups and can't wait to try more soup flavors. I really appreciate the more natural approach that Frontier Soups has regarding it's ingredients and I felt good feeding this to my family. 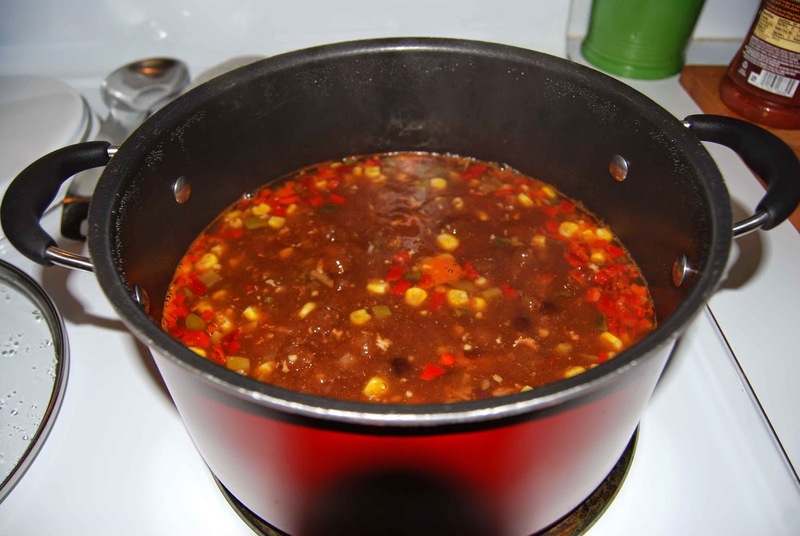 We will definitely be dining on Frontier Soups more often in the coming, cooler months! Frontier Soups is offering an exclusive Moms Meet deal to share with the readers of All Things Katy! With the Moms Meet Soup Mix 6-pack, you‘ll get 20% off the original price, plus free shipping on your order! 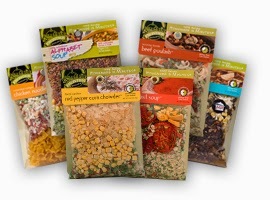 To purchase, visit frontiersoups.com/moms-meet-soup-mix-6-pack. This past Saturday, Lil' Miss joined me at work for a couple of hours. J, the eight year old son of one of my bosses also joined his mother at the shop. Katy matter-of-factly responded, "From God." When J asked again, "No, where were you born?" Katy responded, "At a hospital. I'm American." Heehehehehe... Truth from the mouth of babes! I recently did a sweep of my four year old daughter's plastic plates, bowls and cups. That stuff seemed to magically multiply and take over our cabinets! So, out went the baby sippy cups, the plastic throwaway cups from Moe's and the many random plastic ware utensils/plates/bowls. We were left with very little. Now that she is older, she doesn't need a sippy cup. She's past the constant spills of the toddler years. However, our taller, fuller glasses seem a bit overwhelming to her (and more prone to accidents). Enter in The Kupp and problem solved! The Kupp is the perfect transition piece for young hands. It's small enough for littles to use, refill and hold. Yet, because The Kupp is glass, it feels grown-up and sophisticated (very important for my Fancy Nancy obsessed Lil' Miss!). 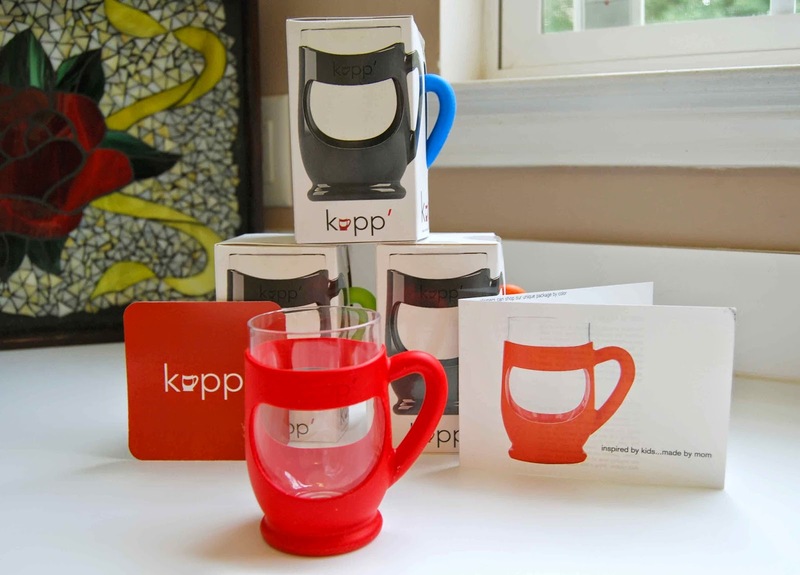 Plus, because of the BPA free silicone and glass cup, The Kupp is a great environmentally sound choice to drink from! This fits in well with our family's commitment to go "crunchy" (I.E. Almost three years ago, we gave up paper towels, we use cloth napkins at most meals and only use paper plates with guests). Because Lil' Miss is an only child, we didn't necessarily need to use The Kupp to identify each person's cup (to be responsible for). However, the artist/designer in me, loves and appreciates the bright, fun colors- red, blue, orange and green. The smooth shape is also aesthetically pleasing. Lil' Miss definitely prefers to drink from The Kupp any chance she gets. She can easily grab The Kupp from her special cabinet, fill/refill it up from our fridge door and carry it to and from the table (without spilling!). She LOVES The Kupp!! "The Kupp’ was created by Katesplace founder Kate Oliver as a tool to help her young boys learn accountability and responsibility. She gave each of her children their very own glass in a different color and put them in charge of their cup and all of the responsibilities that came with it, including setting the table, washing, and putting it away. She quickly discovered that she had a cleaner kitchen and her family consumed less plastic. 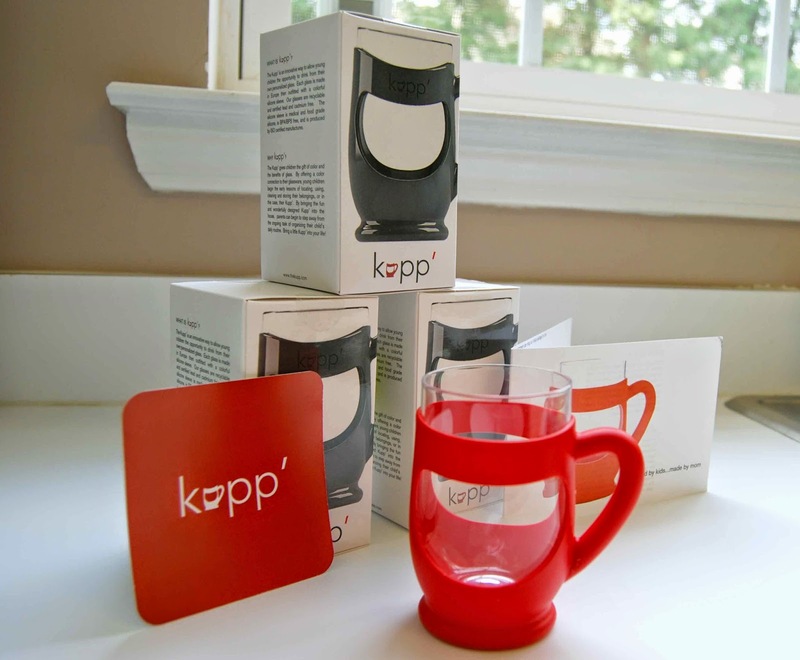 As a result, the Kupp’ was born—a six-ounce glass with a colorful silicone sleeve designed just for kids." 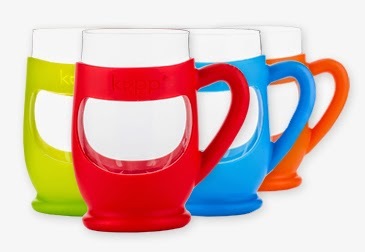 •The Kupp’ comes in four vibrant colors that represent the environment: blue for water, green for earth, orange for the sun, and red for warmth. I love the subtle, underlying meanings of each color. I also like the fact that the lower silicone curve is meant to mimic a smile- so friendly! 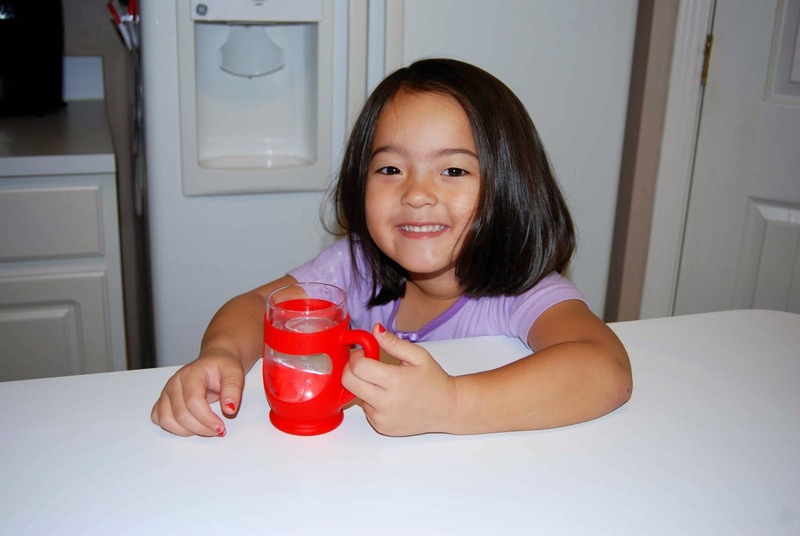 •The Kupp’ is the perfect serving size for children, and allows them to become more conscious of waste and consumption. Personally, I found the size to be a touch on the small size. I don't know if it's because my four year old daughter drinks more water than most, but I found that she seems to have to refill it several times within one meal. •The grip-friendly silicon sleeve is BPA/BPS free and made with medical and food grade silicon to prevent damage. 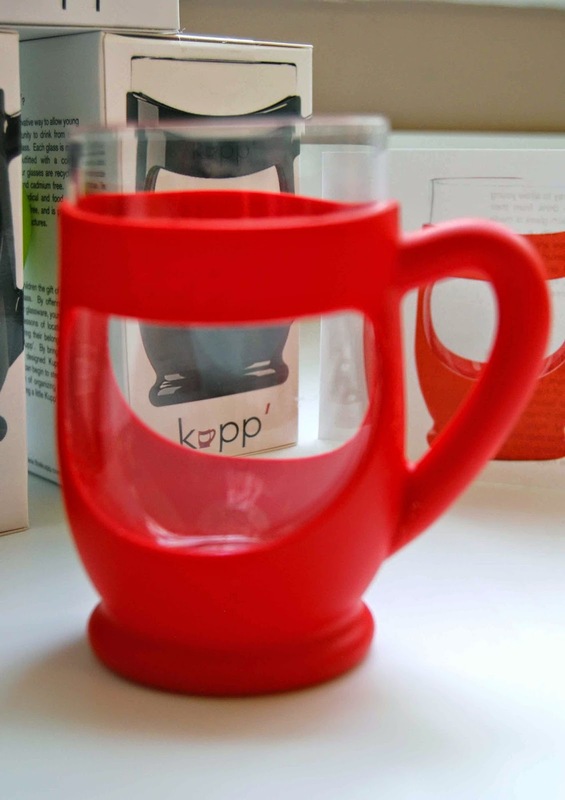 The sleeve does not have to be removed when washing, which makes cleaning your Kupp’ very simple. The Kupp is very low maintenance- LOVE THAT! Connect with the Kupp’ online to see their latest products and get exclusive access to discounts and special offers! For quite some time now, Ted and I have taken to spelling various things that we don't want Lil' Miss to understand/know about beforehand. Every parent does it- you know what I'm talking A-B-O-U-T.... "Do you want to go to C-H-I-C-K-F-I-L-A for lunch...? ", "Is it time for B-E-D...? ", "Does her next doctor's appointment include "S-H-O-T-S...?" The other night, Ted and I were talking about possible dessert options for Katy. I asked Ted if he had, "...given her a P-O-P..." yet. Before Ted could respond, Katy ran to the freezer, pulled out a popsicle (we sometimes call popsicles, "Pops.") and exclaimed, "Nope! May I have a pop, now?" Wordless Wednesday- "Katy, Katy, Quite Contrary.... How Does Your Garden Grow?" Apparently, Lil' Miss has been learning Spanish at Preschool, this year. While we were driving home in the car, one day, last week, Katy told me that she had learned how to say "Hello and goodbye" in Spanish. To test her, I asked her to say, "hello!" in Spanish. Immediately, she proudly shouted out, "OLAF!!" (from the recent Disney hit, Frozen). Now, if you are the parent to any child under the age of eight, this is kind of funny because most of your free time is spent watching/listening/playing with anything having to do with Frozen. I corrected her and told her that it's actually, "HOLA" not, "OLAF." Katy paused, thought about it and then asked, "Well, then why does Olaf (the snowman character in Frozen) say, "Hello, my name is HOLA and I like warm hugs" in the movie??" Hahahahhaaha.... the logic of a four year old! A new year, a new year of Lunch Bunch! This year, the focus is letters. First up to bat, the letter A! 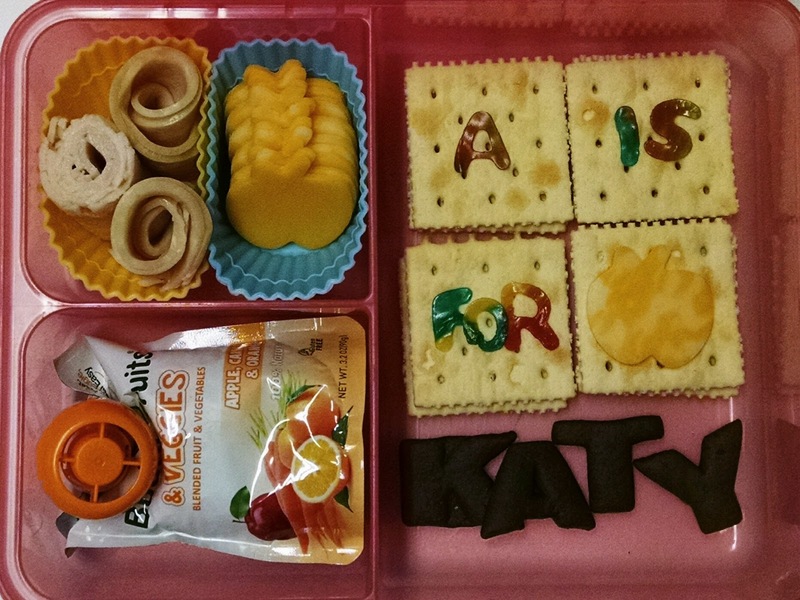 So, for this past week's lunch, I did an "A is for Apple" themed lunch. Apple shaped cheese, turkey spirals, applesauce and crackers rounded out the lunch. I'm happy to report that Lil' Miss ate everything but the fruit roll-up letters! Last weekend, we were having a family day at Ikea. Ted and I were looking at the pillows, in the hopes of replacing our flat, old, tired pancakes. As we were looking, I told Ted to, "....avoid the down ones..." because I'm allergic to down feathers. Katy quickly interjected, "Okay, Mommy- I'll look for the UP ones!" Heeheehee.... that made us smile! I had the wonderful privilege of discovering the humble, paper book as a rare and stand-alone piece of art. Through several bookmaking classes, I learned everything from pulp to paper, to binding to create a book. A fine arts piece. The content was not always relevant- the construction and the beauty that went into it, was the goal. It's been a long, long, long time since my days of mixing pulp into paper and stitching book signatures together. However, when I recently had the opportunity to review little book of BOOK MAKING by Charlotte Rivers, the excitement of creating something tangible and artistic in the form of paper and spine, came flooding back to me. little book of BOOK MAKING by Charlotte Rivers is a beautifully illustrated book that takes the reader through the basic anatomy of a book (page 8) to intricate spine stitching, such as the French Link Stitch (page 156). In between these extremes are beautiful examples of the book as art from around the world. USA, UK, South America and Asia are all represented with their contributions on the bookmaking world. Example pictures are rich in detail and excite the reader to observe the lowly printed paper book in a whole new light. Later in the book, step-by-step instructions are included to help the reader create everything from a simple pamphlet stitch book to a flag book to a more complicated Dragon book. Pictures in the step-by-step section are less than impressive but they do aid in the overall understanding of the construction of a book. Overall, this book is exciting to read and shows beautiful examples of fine arts books and the art of bookmaking. 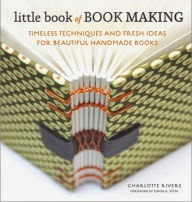 While not a staple in every creative person's library, little book of BOOK MAKING by Charlotte Rivers definitely delivers in it's promise to, "Timeless techniques and fresh ideas for beautiful handmade books." 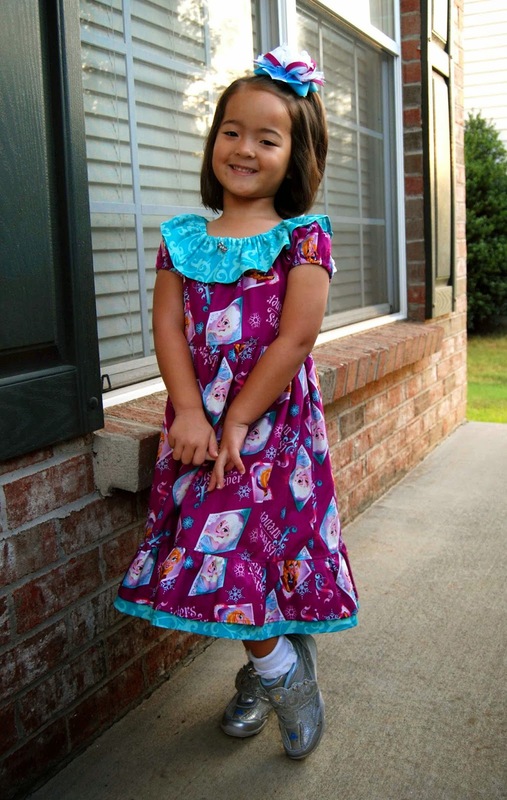 Frozen Dress sewn by Mommy using Made for Mermaids Belle PDF sewing pattern. Say, "Yay for the First Day of School!" 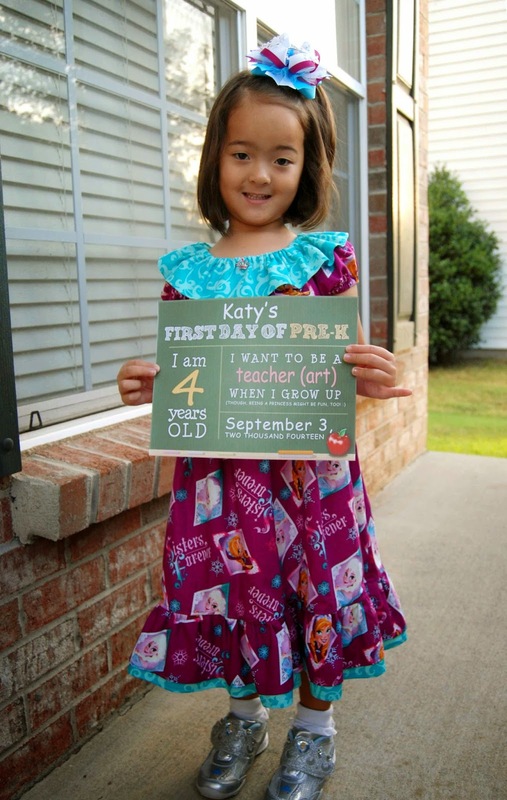 Katy's (Last) First Day of Preschool was today! 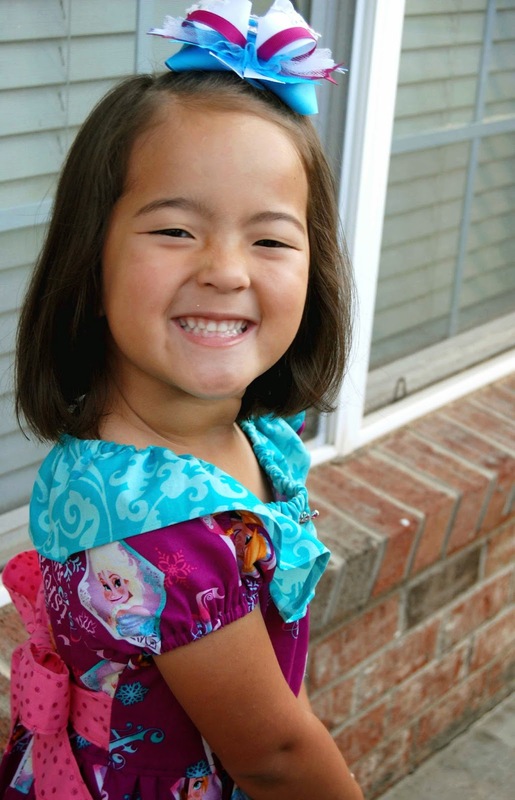 She returned to St. James Lutheran Church Preschool to the four year old class. Mrs. Laura and Mrs. Amy-Lyn are her teachers. Lil' Miss was SOOO excited to go to school that she was up and at 'em well before 7 AM, this morning! She marched right into her class and didn't even look back. We've come a long way from the the clingy good-byes of the two-year old class! She's going to have a GREAT year! She's so ready...! The real question is, am I?!?! We're not huge soda drinkers in this household. It's just mostly water, milk some tea and lots and lots of coffee for us! 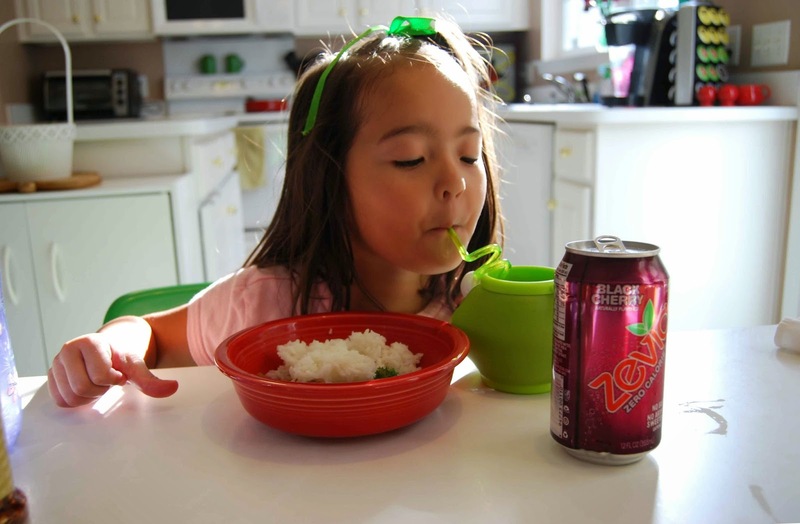 ;-) However, I recently had the opportunity to try out Zevia Zero Calorie Soda as a Moms Meet blogger. I thought it would be a fun (less guilty) treat. Right out of the box, the artist in me really enjoyed all the pretty, vibrant colors that the soda cans come in. Pink! Red! Orange! Blue! Green! So fun and aesthetically pleasing. The artist in me really appreciated the outside can graphics. We put several cans in the fridge to chill and we pulled them out to enjoy with dinner. I chose Cream Soda. Hubby chose Mountain Zevia and as a special treat, we allowed Lil' Miss to try a little of Black Cherry. Sadly, Hubby and I were pretty disappointed with our choices. Personally, I felt like the Cream Soda had a funny after-taste and just barely tasted like the cream soda of my youth. More than anything, the sodas tasted just like fizzy carbonated water with a funny, artificial after-taste. Hubby's Mountain Zevia definitely didn't taste like it's big-name counterpart. 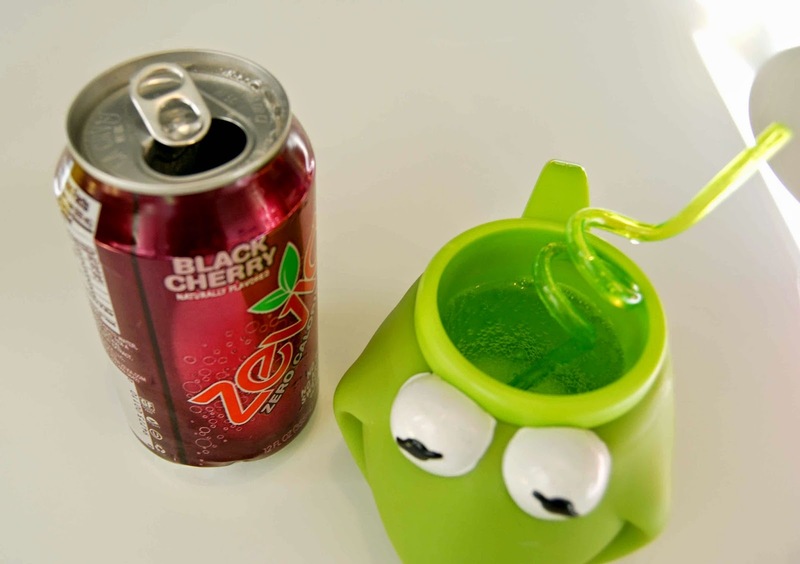 One thing that surprised us was the fact that Lil' Miss' Black Cherry came out as a clearish liquid. Not the dark liquid we were expecting. The other thing about the Black Cherry- there is no "cherry" listed in the ingredients of the Black Cherry soda. Huh...? 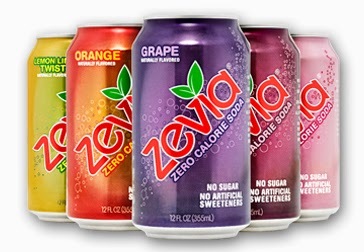 So, in short, our family didn't care for the taste of Zevia Zero Calorie Soda. I can see the "attraction" of a zero calorie, naturally sweetened soda. However, I think we've decided that we'll just stick to our water, milk and COFFEE!! Lil' Miss enjoyed her special soda "treat." 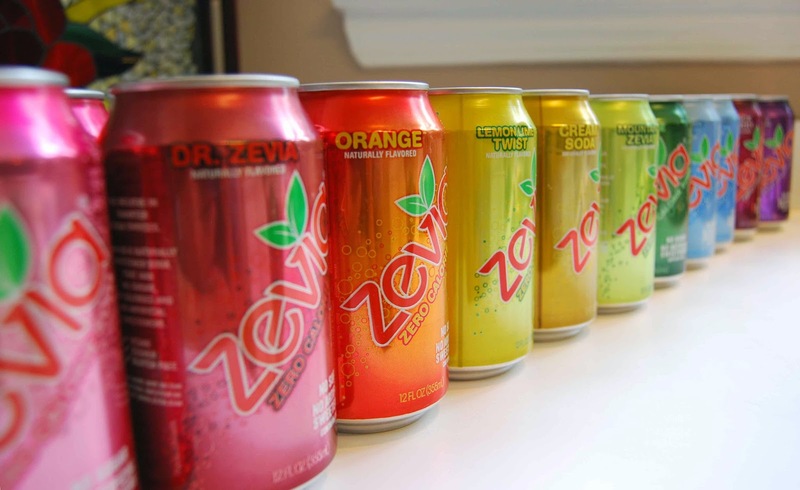 From Zevia Zero Calorie Soda, "Zevia is the original naturally sweetened, zero calorie soda with no sugar and no artificial sweeteners. This tasty treat comes in 15 familiar, favorite flavors including Cola, Black Cherry, Cream Soda, Grapefruit Citrus and Ginger Ale. Consider it the smarter soda go-to for you and your family. 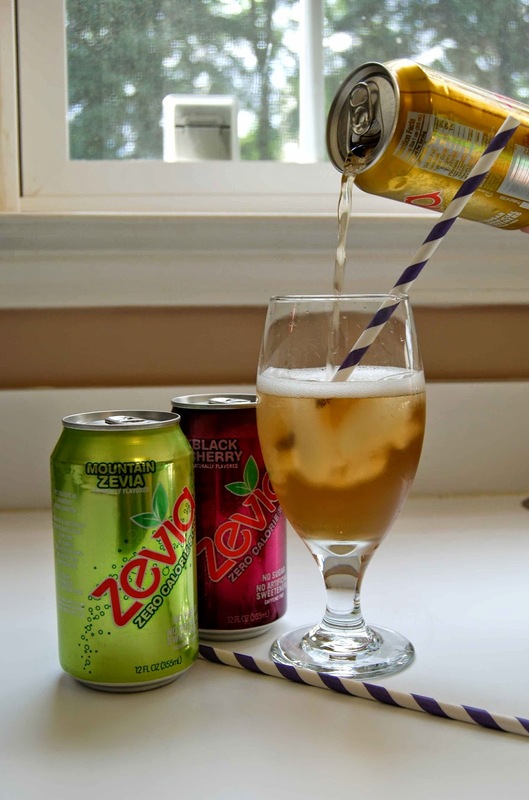 Zero calories, naturally sweetened and delicious; Zevia is the soda trifecta of awesomeness." Zevia wants to celebrate your unique voice by discovering what makes you an original! The folks at Zevia are hosting a style challenge designed to highlight your calling card, whether that’s kitchen wizardry, a killer fashion sense, or just being an all-around super mom. Zevia will be rewarding their community (and yours!) for winning style with $100 Target gift cards, oodles of soda, t-shirts, swag and so much more, every day for 22 days! 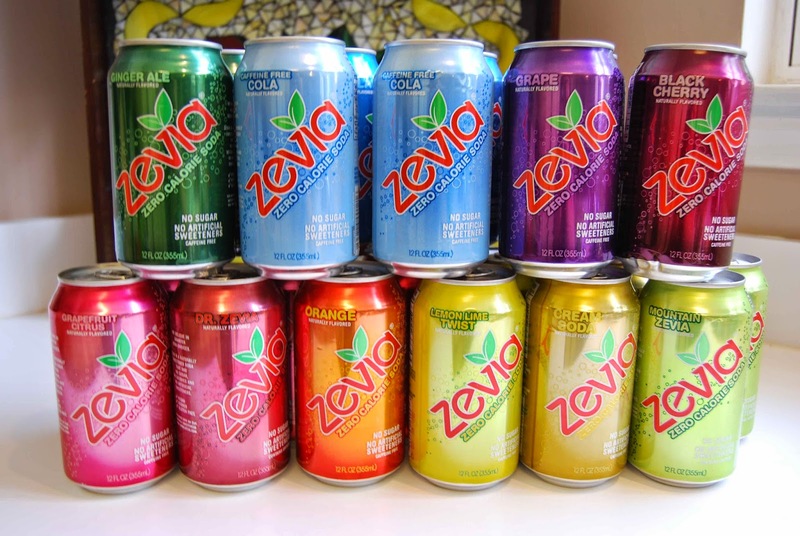 style pics to Instagram (@zevialife) or twitter (Zevia), tag Zevia and #ZeviaStyle and you’re done! For complete details, head over to zevia.com/stylecontest and don’t forget to include #ZeviaStyle in your posts to be sure your unique voice is heard!